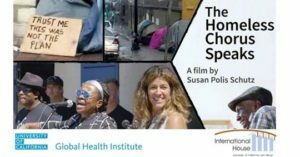 This powerful documentary, as seen recently on PBS, paints a real picture of the lives of the homeless in San Diego. Life is tough on the streets, but hope has come in the form of a homeless chorus, an outreach project formed in 2016 by two local musicians, turning their compassion into action. In Susan Polis Schutz’s interviews with fourteen homeless members of the Voices of Our City Choir, they tell their stories—from women who have been abused, to those battling addictions, to people who just can’t afford housing, to people who need medical care. They talk about their hopes and dreams, and what each think the solutions to the homeless problem might be. What the film makes clear is that there is no one-size-fits-all narrative to explain a crisis that’s worsening, according to government figures, with more than a half a million Americans homeless. For members of the Chorus, singing inspirational songs helps the harsh realities of the street evaporate, if only for an hour. Together, in their shared voices, they find joy and family. And from their music comes the power to change lives. Todd Rockhill, social worker at Charlotte’s Housing Services, will be leading our discussion afterwards. We’ll also be tying fleece blankets to donate to Housing Services to help the homeless, and we’re asking people to please bring new socks (children and adult sizes) to donate to the cause.